Where did the color go in fashion? And what does it have to do with your Twitter profile? I like comparing things. And recently, as I was looking at a previously assembled collection of Fashion Brands, I discovered that the Twitter avatar for every single one of them had zero color. None, zilch, nada! Now, honestly I can’t tell you why fashion brands that push new colors on us every season seem to all migrate to black and white for their social media avatars. It’s very interesting to see, however, and brings us to some bigger questions – How does your digital elevator pitch compare to others in your industry? Do you know how your own Twitter bio or other social profiles stack up against peers and competitors? Twitter is Changing Their Profile Pages. Did You Notice? Between your social images and your bios, these online elements serve as a digital elevator pitch for your brand, and I recommend that you review these elements quarterly to make sure you are still happy with how you are presenting yourself and your business to the world and how that stacks up against the market in which you operate. Now, taking a close look at your Twitter profile for visuals and language is even more important as Twitter recently started testing some drastic changes to how your profile page is formatted. Twitter is rolling out the changes for users is random at the moment, so you may not be able to see all the changes just yet. The major impact for now is that your profile picture changes position, your header image becomes a large banner, and if you have a custom background design . 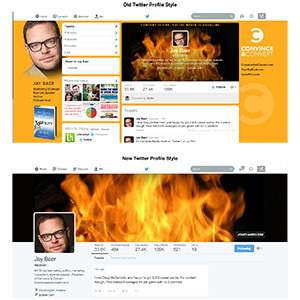 Look at how our friend Jay Baer’s Twitter profile as it looks to someone who sees the “old” profile vs. the new profile. You can see that all the custom design part of the background that is wisely used to communicate valuable information has disappeared. What Does Your Twitter Bio Language Say About You? Soon you’ll have less background space to communicate your story, which means your bio will become more important than ever. Is the language you are using to describe yourself on Twitter putting your best foot forward? You’ve only got 160 characters to explain to people who you are, why they should follow you, and why they should consider engaging with you. Depending on your brand there are certainly multiple ways to attack this, just look at the Twitter bios that started this post as an example of different approaches. No matter what, make sure you are deliberate and conscious about what you are putting out there. This may be one of the first places a new fan/follower/customer encounters you. So, after looking at your own Twitter profile I’m curious, are you seeing the new or old profiles? Did you change the language you used to describe yourself or your company? Let me know in the comments.